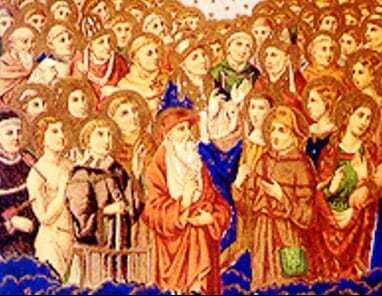 Description: This handout or church bulletin insert for All Saints Day explains Church doctrine about sainthood, the communion of saints, and the unifying significance of the Sacraments of Reconciliation and Eucharist, described in the context of the reader’s own calling to be holy. It uses the scriptures from Mass on the Solemnity of All Saints Day and teaches the value of meditating on the Beatitudes. Matthew 5:1-12 reminds us that we are saints because we are blessed. Isn’t everything that God blesses made holy? Therefore, any person whom God blesses is made holy: the poor in spirit, those who mourn and receive the Holy Spirit’s comfort, the meek who stand firm in what’s right without arrogance or force, and so on down the list of beatitudes. Ideas for use: Distribute as a handout or bulletin insert in All Saints Day Mass and celebrations, or distribute it any time in the church pamphlet racks, adult education class about life after death, RCIA class, parish retreats, etc.